Three schools local to our base in Berkshire and two schools local to our Yorkshire base, proved great visits and gave Kath and I a great time in the run-up to half term. Parsons Down and Francis Baily in Thatcham and Falklands Primary in Newbury are all old friends of ours. 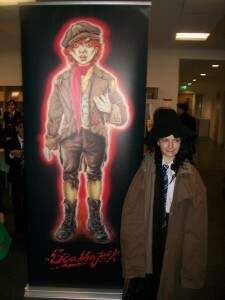 Our job in all three schools was to present the new book, Kruschmeister and its prequel, Scabbajack. 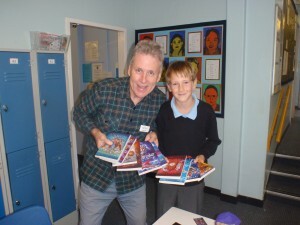 Our big KS2 audiences responded wonderfully to our spooky presentation and were more than enthused to get their signed copies of the books in readiness for half-term reading – though I suspect most fans started at the first opportunity! We challenged our readers to dare to read their books in bed; some seemed keen to rise to the challenge whilst others stated they would prefer to play safe and digest our creepy stories in daylight! A BIG ‘thank you’ to Ms Cole, Ms Mumford and Ms Prentice for all their help and support. It was such a pleasure to almost fall out of bed and arrive at these lovely local schools within minutes, something we are looking forward to doing much more frequently in future. There are a good many schools in West Berkshire and Kath and I are more than willing to call in and do our best to help the staff raise the all-important profile of literacy in the curriculum. 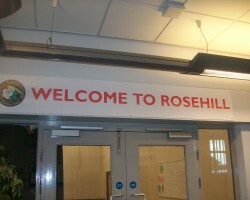 Always welcome at Rosehill Juniors! targets for the new week ahead. I think we’ve visited Rawmarsh Rosehill more than most schools over the last ten years or so and that’s because it’s a school that never fails to deliver. Our very good friend, Mr Wagstaffe, has always regarded literacy as a major part of the school ethos and this is reflected strongly in the reading culture he and the staff have developed in the school. They also have a strong football interest among the community and hence I couldn’t wait to introduce Kruschmeister to them. One of their Year 6’s is a great footballing potential – a girl in Year 6 called Sydney; it was fab to meet up with her and sign her a copy of the book. I asked her and some other keen footballers at the school to tell their team mates about the book and spread the word…I hope they don’t let me down…I very much doubt it! Final call was to a school where we have a very strong connection – Oakwood High School. Both my sisters attended this school and I lived close by as a boy for a considerable time. In fact some of my old school pals went to Oakwood. I attended a school called Old Hall, and I have fond memories of playing against Oakwood when I was a member of my school football team. The school has just been moved to a brand new building and Kath and I were more than impressed as we drove into the car park. We did a great presentation to a marvellous Year 7 – about 220 pupils in all – in the schools new hall/theatre setting with raised seating and a very large cinema-size screen. Brilliant! Many of the pupils knew us from their primary school days and were already big fans of ours. It was a win-win situation for everyone! The next day we officially opened the new library and signed countless copies of the new book for our enthusiastic fans. 23 books were awarded as prizes for pupils who had completed work based on our books and our congratulations go out to them. Our thanks also go out to the two great librarians, Sally and Julie, for all their help and enthusiasm. As we always say, great librarians are so essential in maintaining interest in reading and literacy in the school environment…a BIG thanks to both of them. I was due to visit one more school before the half-term break, Anston Park Juniors, more massive fans of ours. Alas! My voice went and we’ve had to postpone the visit until later in the term! As Kath always reminds me…I talk too much! Never mind, I will rest my voice over half-term and allow Kath to get a word in edgeways for once! Have a lovely rest everyone and see you all soon. 1. I read this book in three sessions…I found it hard to put down. Spell-binding! Michael McCrossan. Please can we have lots more reviews messaged to my website…it would be great to hear from some of the footballers among you, both boys and girls. 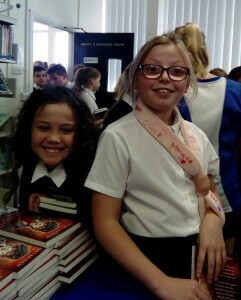 BIG SCHOOLS – BIG FANS – BIG BOOK SIGNINGS! This post was written by peterjmurray on October 10th, 2016 4:12 pm Comments Off on BIG SCHOOLS – BIG FANS – BIG BOOK SIGNINGS! We have just finished one of the best two-week tours of all time; the fabulous North East of England did us proud yet again. Hexham Middle School, Whytrig Middle School, Valley Gardens Middle School, St Columba’s RC Primary School…all amazing places to visit! After our Hexham visit, reported in the last blog, we moved on to the other schools listed above and presented the latest book, Kruschmeister, and the prequel, Scabbajack. The two books proved a huge success and we had problems immediately in running out of books during our signings. 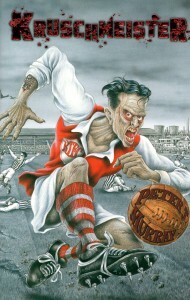 Never mind…son, Simon, stepped in back home and dispatched more books out to our desperate fans. consignment of books to Valley Gardens and Kath and I would like to thank the pupils at this amazing school for their patience and understanding in waiting for their spooky reads. We would also like to thank Vinny Turner at the lovely St Columba’s Primary for their enthusiasm and help in agreeing to put in an order for books subsequent to our visit. By the time we got there we had no books whatsoever! I guess we must be doing something right! On a lovely day on Thursday 6th October we returned to the Edmund Hillary School in Worksop, not far from our northern base. We last visited this school two years ago and had an amazing time. We wondered if this return visit would be as good? No worries whatsoever! In fact, this visit proved even more amazing. It quickly became apparent that we had not been forgotten and our range of books was firmly established on the bookshelves of the Edmund Hillary School family community. We presented our new book, Kruschmeister, along with the prequel, Scabbajack, to the new year 5’s and 6’s, and it all went down brilliantly. We returned the next day for a book-signing and were ‘blown away’ by the fantastic response. In fact, one mega fan came along and insisted on purchasing our full range of books and almost needed a trolley to carry the books back home with him. (see pic). A HUGE thanks to all at Edmund Hillary School for making Kath and I so welcome and having so much enthusiasm for the work we do…this is what really drives us on! South East….North East…what does it matter! We are lucky in that the schools we visit seem to be equally fabulous wherever we go! We arrived in the wild fells and moors outside Hexham on a very windy late afternoon. Our accommodation turned out to be a gem of a place – loved by walkers and ramblers no doubt. 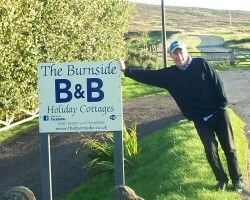 It’s called Burnside, located close to the village with the cutest of names – Edmundbyers. Our host, Jenna, settled us in and looked after us during our three day stay. It proved the ideal retreat after busy days working in school. …And speaking of schools…our hosts over the next few days was non other than Hexham Middle School. 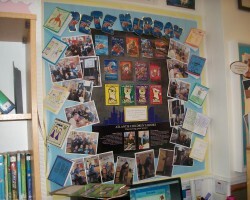 We did two presentations; the first to Years 5 and 6 and their choice of books was the Mokee Joe series. The audience were more than appreciative and a pleasure to perform in front of. The next day the KS3 pupils – Years 7 and 8 – proved just as appreciative during our Bonebreaker presentation. It made a real change to see Year 8’s keen to come up on stage and use their acting skills in bringing the narrative to life. All in all our Hexham experience was extremely enjoyable. It was our second visit in a relatively short time, and I have a feeling there will be many more visits to come. A big thank you to Mrs Johnson, our hostess who did so much above and beyond the call of duty in ensuring everything passed smoothly. Hope to see you all again soon. In the meantime….keep on reading! 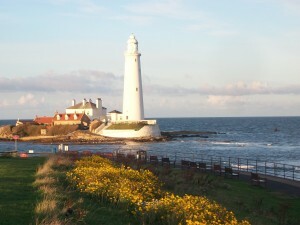 St Mary's lighthouse, near to our caravan. Janet Rutter, at Whytrig Middle School in Seaton Delaval. We hadn’t been back to this school for some time and it turned out that only the Year 8’s recalled us from our last visit. We launched into a presentation of Scabbajack and Kruschmeister and the entire audience sat spellbound. I can’t wait to get back there for a book-signing after our Whitley Bay weekend. We’re staying in a luxury caravan and really enjoying it. I couldn’t resist visiting the nearby St Mary’s lighthouse today (Sun) and climbing the 137 steps to the top. The spiral stairway is bolted to the wall and is open and rickety. By the time I’d been up and down it I was shaking and my hand was imprinted with a tight grip of the rusted metal stair rail! Kath wouldn’t go anywhere near it and I really don’t blame her. Apart from our Whytrig book-signing next week, we are also looking forward to visiting Valley Gardens and our old friend, Jon Roys. He is going to love the Rotherham-based Kruschmeister setting, as like me, he is from Rotherham. 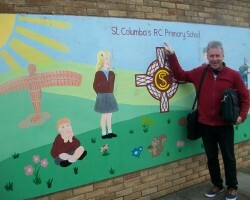 Our final NE visit next Tuesday will be in Wallsend with St Columbia’s RC Primary. Again, friends of ours, and keen on hearing about our latest book – Kruschmeister. I know they will be thrilled with it. And I do believe that one of the teachers, Mr Turner, is taking us out for dinner…maybe to downtown Wallsend!